Welcome to the Aerotech News and Review Digital Edtion! We have SO MUCH GREAT READING in this week’s issue of Aerotech – starting with our cover story, the arrival of the KC-46 at Edwards AFB for a new, more robust round of flight testing. The Pegasus is intended to start replacing the Air Force’s aging tanker fleet, which has been refueling aircraft for more than 50 years. On page 3, we read of NASA’s continuing partnership with a new generation of space pioneers and entrepreneurs, to advance research and technology. Of more than $43 million recently awarded, $1 million of that money is coming to small businesses in partnership with NASA Armstrong Flight Research Center, right here at Edwards AFB. Page 5 is our “party page” – an overview of Plane Crazy Saturday, coming up this weekend at Mojave Air and Spaceport (always great fun!) and a “Pilot’s Call,” next Friday the 22nd at Bravery Brewing. If you go out to Plane Crazy this weekend, check out the spiffy new paint jobs on the “Gatekeeper” aircraft at the Spaceport – Linda Reynolds went out and got some photos and a story for us, they’re on page 7. 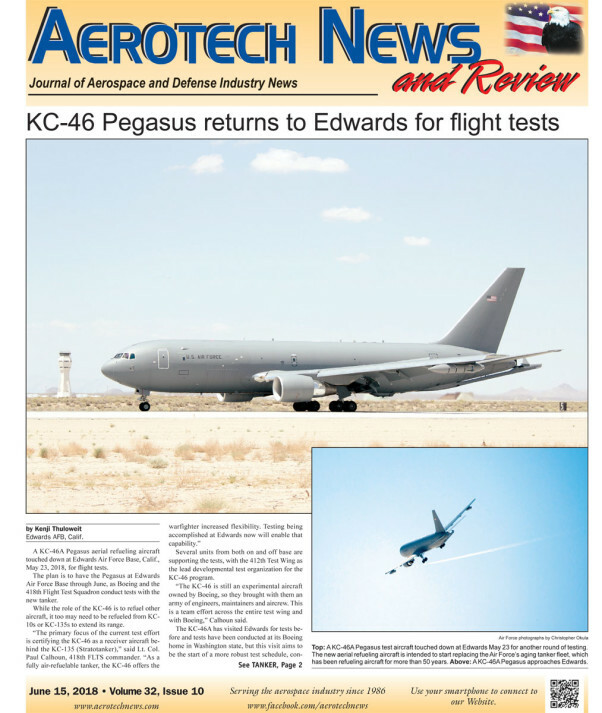 And if you want to go even further out on Highway 58, turn to page 10 for this week’s High Desert Hangar Stories, where Bob Alvis shares the Edwards AFB connection to a place all us voyagers to Vegas know well: Kramer Junction. One final plug: great story on page 12, covering last week’s observance of D-Day in France. You’ll love it…. All in this week’s Aerotech!